Join the war and lead your nation to victory. Hinterhalt 2 is a cartoonish World War 2 single player first person shooter game with tons of fun and excitement. 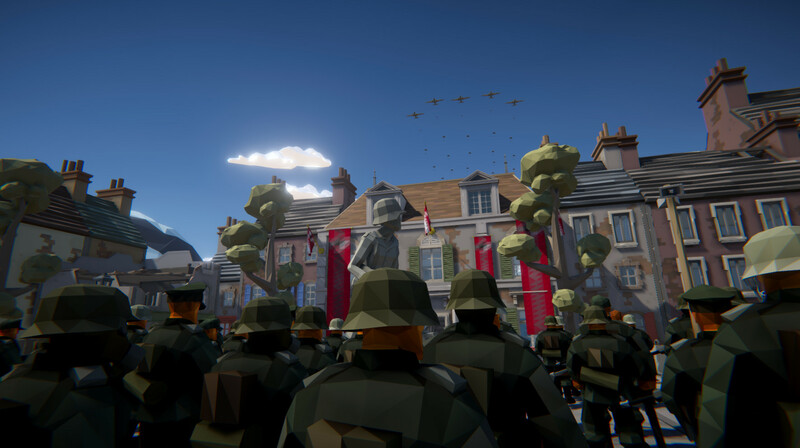 Play as the Germans, Americans, Soviets, British or even as the Japanese. You decide. Fight against boots during the campaign and skirmish mode or face hungry hordes of zombies with limited ammo supplies. The gameplay is similar to the classic "shoot, run, die and respawn" genre. Infantry combat only with lots of chaotic battles. The cartoonish low poly look allows you focus more on the gameplay, rather than the graphics, making the game. All background music tracks, as well as the entire UI design, have been carefully chosen and add a great experience to the gameplay. The campaign consists of 5 big battles you have to win in order to advance. Each battlefield is huge and unique. You will play different factions along the campaign and be able to replay any mission you like as often you wish. The gameplay during the campaign is comparable to the one during skirmish mode, but with a pre-defined faction and a fixed number of enemies and allies. The concept of skirmish is simple. Choose a team, an opponent, and beat him. There are several locations and battlefield sizes to choose between and you are able to adjust different settings such as the amount of AIs or respawn tickets, or the rotation of the sun to simulate different day time hours. As a great fancy bonus feature you can play against hordes of Zombies. You initially start with friendly AIs who will eventually get mad and start shooting everything they see, including teammates, so watch your back. Different supply stations will provide you with random weapons, but watch out, you might get unlucky and get nothing more than a shovel to protect yourself.